If I was motorcycle I would tell my owner to learn how to properly tie me down. Sounds crazy, right? Many of us think of our bike as another family member. I mean, we call them our “baby” but don’t necessary treat them like one. Moving your bike in a truck, trailer or crate requires proper securing to avoid damage, and this can be a stressful event for any bike owner. Motorcycle tie-downs are a trending topic amongst avid riders because they understand that damage to their motorcycle could mean a delay in their next ride. The damage from a failed tie-down could be as simple as some scratches, a broken lever, or as catastrophic as a broken engine cover that won’t hold oil. Either way, it’s costly but can be avoided without spending much at all. It all starts with using the correct tie-downs. Don’t wait until the last minute to prepare. Here are some tips that will help ensure that your bike arrives safely. Ratchet or Cam buckle-style: what’s the difference? You have two basic options, and a lot of styles within those segments. But both of them aim to not only hold your bike safely in place, but to increase suspension tension. The latter helps ensure that a motorcycle’s suspension is activated if you hit any bumps on the road. Although tie-downs can range from 1-4” wide, the most common size used for motorcycles are 1”, so we will use this size for the focus of our discussion here. The cam buckle is a spring-loaded, cam-shaped buckle. We’re sure you know the type. They are the most basic type of buckle, and are seen on a number of products, including backpacks. They hold motorcycles in place by creating friction as the strap weaves through the buckle. They are the easiest to use by design, but the “teeth” on the buckle that keep the strap from slipping have been known to slip due to dirt or oil build up. Over time the teeth can wear through the strap, making it more prone to breaking at inopportune moments. Ratchet straps are similar but like the name implies, a ratchet features allows you to easily tighten the strap to the right tension using a few quick cranks of the lever. Not only are they easier to tighten, but they also tend to hold together better than their cam buckle counterparts. You can quickly tell a poor, low quality design by the size of the ratchet. The larger and more durable the ratchet, the stronger the tie-downs (and the better they’ll hold your bike in place). Ratchets allow for easy tightening with one hand. Whether you are sitting or standing near the bike, you can easily tighten it to the correct tension. Cam buckles on the other hand require a lot of downward force, which means you need a lot of leverage to get the tension right. Rather than tightening it while in the truck or trailer quite often you’ll have to get out and below the strap to create enough downward force to operate them. The amount of force needed to tighten them satisfactorily can be a major drawback for a majority of riders. Many standard tie-downs have simple “S” hooks at each end which are the easiest to use of both options. “S” hooks clip on to most any location in seconds. But, they are made of steel and only have a thin rubber coating for protection. They can and will damage painted parts and have even been known to leave indentations on steel frames and handlebars. Choosing a tie-down design that incorporates a “soft loop” can help avoid damage to your bike. The soft straps can help you reach around fragile parts at just the right angles to avoid rubbing or putting pressure on fragile bodywork. If fashioned properly they form a secure cinch that holds the bike in place. A number of sellers even offer stand-alone soft ties that you can use with your “S” hook style tie-downs. But the downside is that now you have added cost and one more item to keep with you. The reported tensile strength shown on most tie-downs is usually a measurement of the strength of the nylon strap itself, not the overall tie-down as a whole. You will find ratings near 4,500 lbs in many cases, which to the average motorcyclist seems to be more than enough. But here is the real story on the strength of the tie-down as a unit. The nylon strap itself is the strongest part of the tie-down and the metal “S” hook and tightening assembly is the weakest part of any tie down! Quality “S” hooks can hold somewhere near 1,500 lbs before they fail but even good tightenying assemblies (cam buckle or ratchet) usually reach a breaking point around 600 lbs. Poorly made tie-downs often use assemblies that provide even lower break points. When shopping for you next set of tie downs, read the description closely and make sure you understand the actual strength or load capacity. Nylon material is used for most straps due to its ability to retract a good percentage of the stretch. Stretch is an important feature for a motorcycle tie-down as you want the strap to flex just a bit and not put undue stress on the bike. Most nylon is usually fairly soft, but not all straps are created equal. When you buy a cheap tie-down, you usually get nylon strap material that is not finely woven, creating a coarse texture. This rougher surface can cause light scratching on painted, powder-coated and even chrome surfaces. Finely woven, extra-soft nylon straps are made to combat this issue, although they are harder to find in the marketplace. Most times the tie-down manufacturers will fail to identify the type of nylon strap, so don’t be afraid to ask questions before you buy. Before you think of just moseying on down to your local hardware store and buying the cheapest, “budget option” tie-downs you can find, hang on. These aren’t made for your motorcycle, and we’ve seen them fail time and again. You’ve already poured hard work, time and money into finding the best bike, don’t cheapen your investment with risky tie-down purchases that are prone to fail. 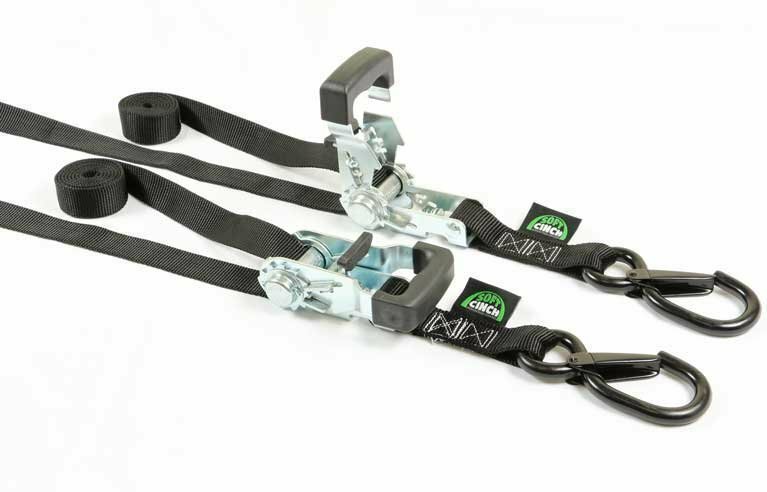 Chapparal is a great place to buy a number of Ancra tie-downs, from the basic cam buckle with a 4500-pound tensile strength to the ratcheting tie-down with a 600-pound working load capacity and ratchet lock. PowerTye offers ratchet tie-downs, fat strap cam buckles and strap-down trailer kits that give you everything you need to lock your bike in place. Their products are used by top custom builders like Saleen, Eddie Trotta, Orange County Choppers and Matt Hotch Designs. DiscountRamps offers a number of different styles of motorcycle tie-downs, soft loop straps and trailer loading parts at lower prices. Always look for top-rated or reviewed products. It’s important to select the correct strap design in order to protect your valuable investment. Motorcycle Shippers sells the exact Soft Cinch tie downs that were designed for the National Motorcycle Transportation Network so that riders like you can take advantage of the versatile design. We’ve combined the ease of a ratchet strap with the extra security of a self-tightening extra-soft nylon loop. Need some tips on tying down your bike? Check out this easy step-by-step breakdown. from our friends over at Cycle World. At Motorcycle Shippers, transporting bikes safely and securely is our mission. We strive to find ways to help riders enjoy the bikes they love. Sharing information is just another way we like to help our fellow riders. Can you help us? What are your favorite tie-downs and why?